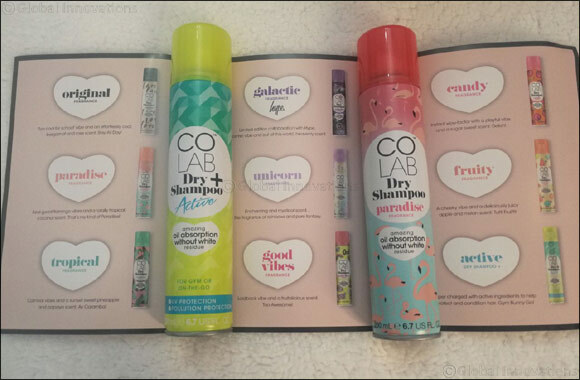 Dubai, UAE, April 18, 2018: COLAB is an award –winning dry shampoo created by a team of beauty insiders, including international blogger Ruth Crilly. Spray the brilliant quick fix formula into roots for amazing oil absortion without white residue- for effortlessly refreshed hair in an instant. Explore COLAB”s collection of fragrances including three brand new scents. Original Fragrance – ‘Too cool for school’ vibe and an effortlessly cool, bergamot and rose scent. Slay All Day! Paradise Fragrance- Feel-good flamingo vibes and a totally tropical, coconut scent. That’s my kind of Paradise! Tropical Fragrance – carnival vibes and a sunset sweet pineapple and papaya scent. Ay Caramba! Galactic fragrance (hype) – Limited edition collaboration with Hype. Cosmic vibe and out-of-this-world, heavenly scent. Unicorn Fragrance – Enchanting and mystical scent. The fragrance of rainbows and pure fantasy. Goodvibes Fragrance – laidback vibe and a fruitlicious scent. Too awesome! Candy Fragrance – Instant wow-factor with a playful vibe and a sugar sweet scent. Delish! Fruity fragrance – A cheeky vibe and a deliciously juicy apple and melon scent. Tutti Fruitti! Active DRY SHAMPOO+ - Super charged with active ingredients to help protect and condition hair. Gym Bunny Go!